Now that we know that brands have human characteristics, like personality, let’s talk about how we form relationships with brands. When I was little, my mother always used Aunt Jemima’s pancake mix. Now that I buy my own groceries (bummer), I always buy the same, because I’ve had a long relationship with the Aunt Jemima brand. It also makes delicious pancakes, but I digress. Relationships with brands can be significant for many reasons. The reason I just mentioned is related to nostalgia, or family ties, but you can also imagine relationships with brands being significant because they remind you of certain friends, or they make you feel good. 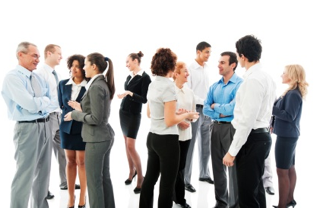 Any way you slice it, maintaining relationships with customers is big business. While there is a great deal of research on brand relationships, we are going to focus on a case study of compromised brand relationships: American Apparel. 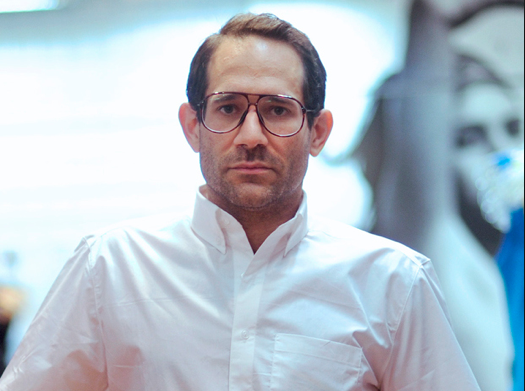 This year, Dov Charney, founder and former CEO of American Apparel was fired not once, but twice. For the fashion-obsessed among us, Charney’s bad behavior has long been discussed in relation with American Apparel and their sexualized advertising. In fact, Dov Charney’s sexual misconduct was first reported in 2004, when Charney engaged in some self-satisfaction during an interview with a female reporter. Since then, Charney has been sued by former employees for sexual harassment or misconduct no less than 7 times. So why fire him now, 10 years after the first reports? Well, a lot of industry insiders think it’s because Charney finally ruined American Apparel’s relationship with its customers. Charney’s behavior was so well-publicized, and led to so much public disdain, that many people transferred these feelings about Charney to feelings about American Apparel. He compromised the brand’s identity by infusing it too much with his own, making it so that shoppers could not help but think about unwanted advances when they were supposed to be shopping for crop tops. And American Apparel’s board was probably right, because American Apparel was hemorrhaging money at the end of 2013, with a total loss of $106 million, a sign of a declining customer base. Brand relationships are incredibly important, and many of the things we’ve discussed, like brand communities or brand personalities, work to build and support relationships with consumers. 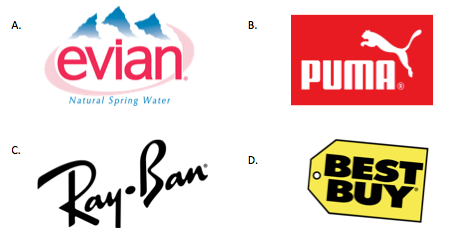 Think about the brands you buy, and the way you feel about them. It may surprise you that they’re more than just products, they’re old friends. Bhattacharya, C. B., & Sen, S. (2003). Consumer-company identification: a framework for understanding consumers’ relationships with companies. Journal of Marketing, 67(2), 76-88. It’s day 6 in our crash course of consumer psychology, and we’ve gotten into a lot of great work on social influence and contagion. Until now, we’ve ignored some inherently social marketplace phenomena: word of mouth advertising and customer reviews. These days, customer reviews and review sites like Yelp help consumers make purchasing decisions, or select products and services better suited to their needs. Customer reviews are supported by the concept of word of mouth, or hearing about something from someone else. Word of mouth is powerful for several reasons. We know from social psychology that other people are often swayed by expertise or experience, and people writing product or service reviews have generally used the product or service.1 We are also persuaded more often by those familiar to us than by unfamiliar people, something researchers have dubbed “tie strength.”2 But as we’ve reviewed in past articles, complete strangers’ product choices can influence us also, so word of mouth can come from a large range of sources. And, boy, is it influential! Research has shown that this product feedback we receive from others has both short and long-term consequences, with word of mouth affecting future decisions, as well as those made in the moment.3 In fact, researchers have found that word of mouth advertising has longer carryover effects and higher response elasticities than traditional marketing efforts.4 Basically, this means that word of mouth is more influential over time, and yields more customers per effort, than traditional marketing. As you can see, word of mouth is very desirable for businesses, and it works better on us as consumers. Petty, R. E., Cacioppo, J. T., & Goldman, R. (1981). Personal involvement as a determinant of argument-based persuasion. Journal of Personality and Social Psychology, 41(5), 847. Bansal, H. S., & Voyer, P. A. (2000). Word-of-mouth processes within a services purchase decision context. Journal of Service Research, 3(2), 166-177. Bone, P. F. (1995). Word-of-mouth effects on short-term and long-term product judgments. Journal of Business Research, 32(3), 213-223. Chevalier, J. A., & Mayzlin, D. (2006). The effect of word of mouth on sales: Online book reviews. Journal of Marketing Research, 43(3), 345-354. Senecal, S., & Nantel, J. (2004). The influence of online product recommendations on consumers’ online choices. Journal of Retailing, 80(2), 159-169. Ahluwalia, R., Burnkrant, R. E., & Unnava, H. R. (2000). Consumer response to negative publicity: the moderating role of commitment. Journal of Marketing Research, 37(2), 203-214. There has also been work on product contagion when the proximity is to a disgusting product. Researchers have found evidence that a product location next to a disgusting product can cause the non-disgusting product to “catch” disgusting qualities, especially when packaging is clear and regardless of whether or not the two products are physically touching.2 This association has proven to be long-lasting, with impressions of disgust permanently attaching themselves to the non-disgusting product.2 So, basically, the next time you really want the last of something at the grocery store but you can’t buy it right now, put it next to the adult diapers and you’re probably home free. Keep shopping and come and see us tomorrow for consumer contamination. Talk about a bad touch. *The Christmas reference in this title is being made by a born and bred atheist and purely for Google/seasonal reasons. No offense meant to anyone, and certainly no religious preferences here at SocialPsyQ! Mishra, A. (2009). 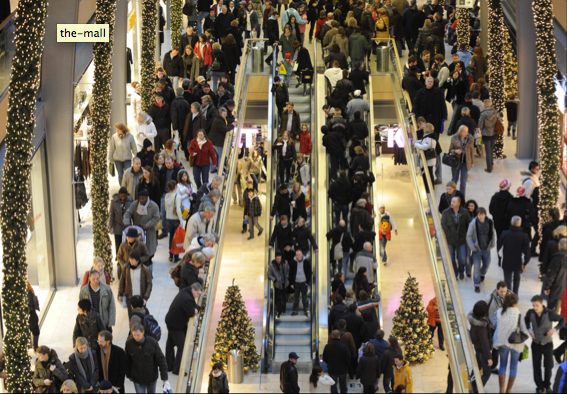 Influence of contagious versus noncontagious product groupings on consumer preferences. Journal of Consumer Research, 36(1), 73-82. Morales, A. C., & Fitzsimons, G. J. (2007). Product contagion: Changing consumer evaluations through physical contact with “disgusting” products. Journal of Marketing Research, 44(2), 272-283. Should kids avoid the cereal aisle for their health? Is it just me, or is the cereal aisle much more complicated and sinister compared to when we were kids? Every time I walk down that aisle, my frustration spikes. The choices, so many choices! Chocolate Krave. Cap’n Crunch. Chocolate Cheerios. Frosted Flakes. Even Rocky Mountain Chocolate Factory has a cereal now, featuring chocolate bits that you can eat for breakfast. That last part is meant to pull in the kids, and it works. Those kids will nag their parents to buy it who will eventually give in[i] because, oh, they’re frustrated, too. Maybe even more than I am. I’m not frustrated because of the mere existence of so many options necessarily. Rather, it’s the quality of the options that is concerning. Are any of these cereals actually healthy enough that children should be consuming them regularly? Not usually. A recent study on cereal quality found that cereal brands marketed to children had 56% more sugar, 52% less fiber, and 50% more sodium than cereals marketed to adults. [ii] Most of these cereals also feature spokes-characters, like the silly rabbit from Trix, Cap’n Crunch, or Tony the Tiger, which are familiar to children and increase the appeal of the cereal brand. And let’s not forget that the combined rate of obese and overweight children in this country is still holding strong at 17%. [iii] That’s nearly 13 million kids. See what I mean about sinister? Now, brand marketing is not inherently negative, but when marketing of unhealthy foods is targeted toward children, then cereal companies like Kellogg and General Mills take a step into the danger zone. Sugary cereals are perhaps even more insidious than other snack foods because they are junk foods disguised as a friendly breakfast. In-store marketing strategies take it one step further. Cereal companies pay top dollar to get an ideal shelf location that will appeal to children[iv]. 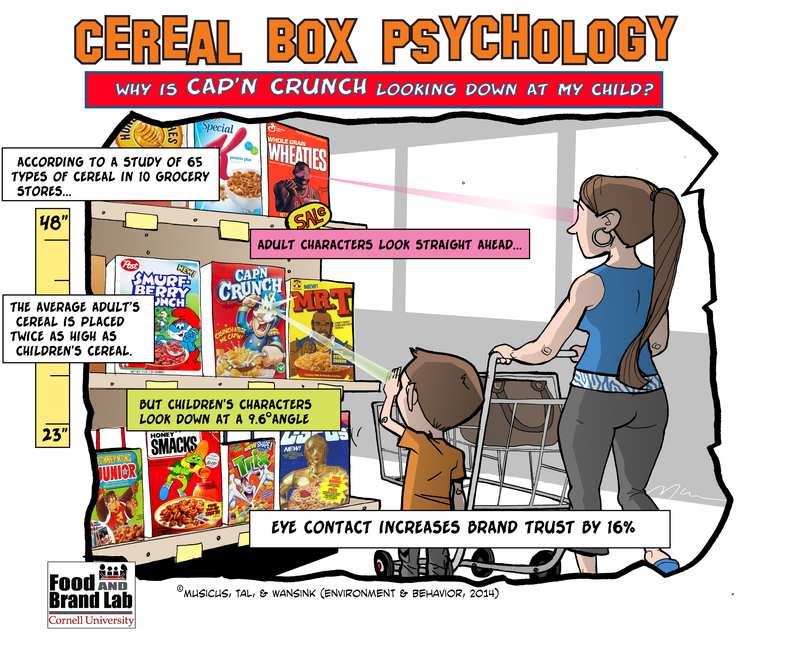 In a recent study published in the journal Environment and Behavior, researchers found that cereal brands marketed to children were more likely to be at a child’s eye level and to contain spokes-characters whose gazes angled downward at approximately the height of an average child[v]. In contrast, cereals marketed primarily to adults featuring spokes-characters (think Wheaties) had level gazes. And this seemingly subtle shift in height and gaze is effective. People in the study reported a strong preference for the cereal that featured a spokes-character that made eye contact. By placing their cereals on the middle or bottom shelf, then, companies are ensuring that children will make eye contact with spokes-characters and feel connected and loyal to that brand. This type of marketing exploits and manipulates children. Cereal companies should be held more accountable. In the past few years and in recent months, especially, there has been a serious push to create stricter regulations for companies that market primarily to children. Based on the findings of Musicus and colleagues, just one of many similar studies, these regulations can’t come soon enough. The issue of obesity is still current. People may be tired of hearing about it, and obesity rates may have stabilized in several states[vi], but that doesn’t mean that it’s gone away. But even if we take obesity out of the equation, even if we recognize that not all children have the same risk factors for becoming obese, it doesn’t mean that kids should be regularly consuming unhealthy sugary food. Parents want to protect their children in every way they can, and they’re stretched to their limits as is. Cereal companies, and all other food companies for that matter, should be held to stricter regulations. Some marketing standards have been successfulvii, but more needs to be done. Regulations should stretch beyond nutrition and include specific marketing techniques, such as shelf placement and use of spokes-characters. We shouldn’t make the cereal aisle another battleground where parents need to be on the front lines. If you’re interested in this topic and would like to learn more, check out the links below. [i],vii A Review of Food Marketing to Children and Adolescents — Follow-Up Report. See http://www.ftc.gov/reports/review-food-marketing-children-adolescents-follow-report . [ii] Harris, J. L., & Graff, S. K. (2012). Protecting young people from junk food advertising: Implications of psychological research for First Amendment law. American Journal of Public Health, 102, 214-222. [iv] Wilkie, W.L., Desrochers, D.M., & Gundlach, G.T. (2002). Marketing research and public policy: The case of slotting fees. Journal of Public Policy and Marketing, 21, 275-288. [v] Musicus, A., Tal, A., & Wansink, B. (2014). Eyes in the aisles: Why is Cap’n Crunch looking down at my child? Environment and Behavior, 0013916514528793.